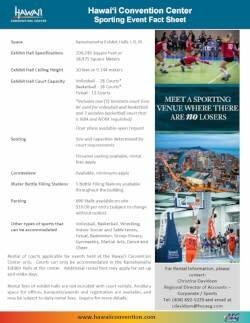 Meet a Sporting Venue Where There Are No Losers! All in a convenient location near gorgeous Waikiki that offers fun for the whole family. Whether it&apos;s time to compete, relax or anything in between. 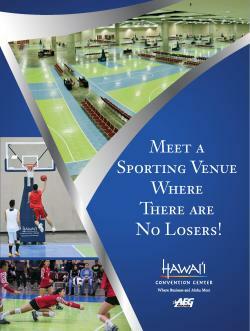 To learn more about what the Hawai‘i Convention Center can offer for your next sports tournament or event, call 808-943-3500. Licensees who have booked a sporting/athletic event at HCC are asked to communicate their initial event requirements to the Events Department at least 6 months in advance of their move-in date. This will allow us adequate time to coordinate the additional logistics and requirements associated with these types of events. 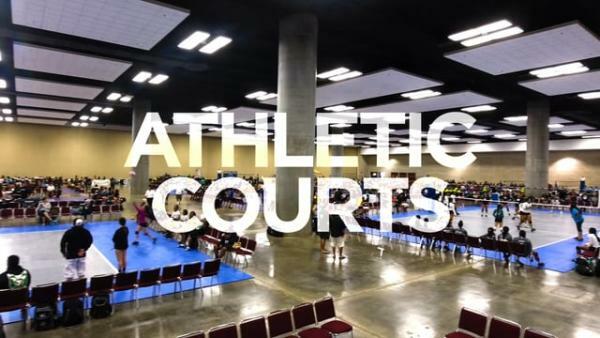 Examples of sporting/athletic events include but are not limited to basketball tournaments, volleyball tournaments, indoor soccer tournaments, dance and cheer competitions, gymnastic competitions and dance workshops. Floorplans and event specifications are due 60 days before move-in. Licensees of sporting/athletic events are required to contract medical personnel from HCC’s exclusive qualified healthcare provider, Straub Clinic & Hospital. The medical staff from Straub are required to be onsite while the event is in progress to provide basic first aid services to injured athletes and participants. They will not be responsible for the taping of athletes and participants. For more information about HCC’s first aid requirements, please contact your Event Manager. Licensees of sporting/athletic events may be required to contract an HCC approved security provider for event security and crowd management services. If ticketing services are required, Licensees will need to make these arrangements on their own since HCC does not have a box office or offer ticketing services at this time. Please contact your Event Manager to discuss your dance floor requirements since HCC has a limited inventory. HCC does not have springboards, practice mats and/or specialty dance flooring (e.g. Marley). 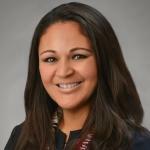 Please contact your Event Manager if you need a referral. 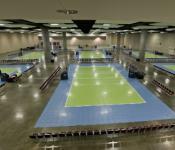 No outside food or drinks of any kind may be brought into the Hawaii Convention Center by clients, athletes or spectators. Clients and attendees are allowed to bring a small refillable water bottle/flask for their own individual consumption. Coolers, portable chairs and inflatables are not allowed in the facility. 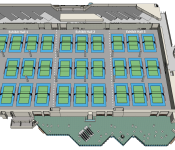 Use and operation of aerial drones within our facility requires advance approval by HCC. Please contact your Event Manager for more details or email eventinfo@hccaeg.com.